So if - or when - the snow does arrive, it always means one thing in the UK. Travel chaos. That favourite headline of the Daily Mail. So it's best to be prepared - and a four-wheel drive car can make all the difference, especially if you fit winter tyres. And what better car for dealing with wintry conditions than the Volvo XC70. This was one of the pioneers of the 'beefed-up estate fitted with four-wheel drive' concept that was taken on by the likes of the Audi Allroad and latterly the Skoda Octavia Scout. The XC70 started life as the V70 XC (often badged with 'Cross Country' on the back) in 2000 before being quickly rebranded as 'XC70'. The Cross Country name wasn't new for the V70 though - Volvo had used it before but this was the first time it was seen as a model in its own right. Volvo took the standard V70 estate and added a four-wheel drive system along with raising the ride height and fitting chunkier bumpers with plastic wheelarch guards. It was basically a crossover before the idea of a crossover existed. 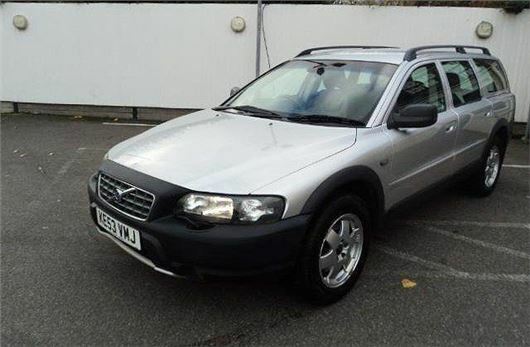 The XC70 has held its value well and for £5k there are plenty of high mileage examples about - many knocking on 150,000 miles and one we saw even had more than 200k on the clock. We've been keeping our eye on the classifieds for a while and eventually spotted this low mileage example with a more respectable 87,000 miles. It's a little older than some on a 53-plate but was strangely registered on the 30th of December. Maybe someone just couldn't wait for their new Volvo. It looks good with its silver paintwork contrasting with the black bumpers and although these dealer pictures are hardly the best, the interior looks in good condition with no noticeable wear to the drivers seat. As ever though, you'll want to go down there and have a proper poke and prod around. Powered by the strong 2.4-litre D5 diesel - as oppose to the far less common 2.5T petrol - it will cost you £290 a year to tax as it's one of those odd cars that should by rights cost £490 but was registered before 2006. Economy is decent too with owners seeing an average of 37.6mpg on Real MPG - a figure that is actually better than the official. Being a 12 year old car there of course various things to look out for but generally the V70 has proved a reliable motor. You can see a list of what to look out for here but there are some key things you'll need to check. If you hear a booming noise at around 3000rpm, this can be an out of balance propshaft and will need sorting. And on early D5 models (up to 2004) a rubber core plug can pop out into the bellhousing, depositing the engine oil on the clutch of manuals. It's a £750 repair job but obviously thousands more if the engine seizes as a result. Check the suspension too. If there are leaks from the suspension units, this is an MoT fail as these are self-levelling units and cost around £470 each excluding fitting.